The colour is a light amber. On the nose it's pure oak and corn, like a great Scottish grain: tons of vanilla, butterscotch, mint, green apple, tropical fruits and buttered croissants (and popcorn, for that matter). Spicy with cinnamon and cloves. Rye bread comes out with water. Luxurious. 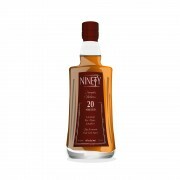 The medium-length finish brings out more maple, with late-arriving rye spice, oak and savoury herbs. The reason I now question whether or not this is 100% corn is because I am getting more rye-ish notes as it oxidizes (and as I add water). Which doesn't mean it has spirit distilled from rye grain (the notes could be from the whisky maturing in used rye barrels). But I wonder. Tasting it side-by-side with another 20 year old Canadian (CC), you get the same oaky smoothness, but the CC 20 is a little spicier and even more complex. Davin de Kergommeaux scores this a 91 (as do I). Highwood Ninety 20 Year Old Rye? We don't need no stinkin' rye !! Had this tonight.... A truly impressive whisky! My favorite Canadian along with Wiser's Legacy. Always have a backup. Would love to get my hands on the new release Canadian Rockies 21 years (46% ABV) and using Highwood Distillery Juice and bottled in Taiwan. Looks like only Alberta and maybe BC will get this one for now. The LCBO informed me they have no plans to bring this in (idiots). Oh well maybe just "Ninety 20" with another year on it and $16 extra for that year. Don't let the LCBO's canned responses get you down, it wouldn't surprise me if they brought it in at some point, especially given the early praise of Can Rockies 21 and recent hoopla over CRNHR.